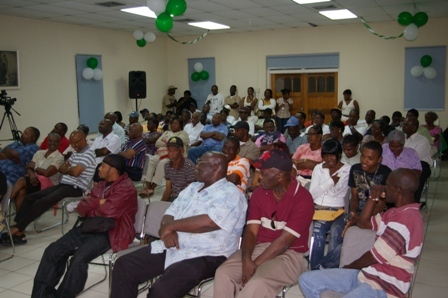 CHARLESTOWN, NEVIS–(Wednesday, March 23rd, 2011) Attorney General of the Federation of St. Kitts and Nevis, Hon. Patrice Nisbett told Nevisians at a Town Hall meeting in St. Maarten on Sunday that he would like to see more offshore institutions of learning on Nevis. According to Nisbett, the former Concerned Citizens Movement (CCM) Administration allowed a 50 year ban on more universities for Nevis. The Attorney General said that the Nevis Reformation Party (NRP) led Administration would work on changing that because according to the negotiations constructed between the Medical University of the Americas and the CCM, Nevisians would have to wait until 2048 for another university on the island. “What the NRP has recognized over the years is that, offshore educational services can be a major player in terms of the economic thrust of the country,” said the Hon. Nisbett. Presently in St. Kitts there are six offshore universities with a population of about 2,000 students who have added to the economy of St. Kitts with car and apartment rentals, entertainment and restaurants etc. “We (NRP) feel that we want to take the country in a different direction in relation to medical universities and the government must be able to do that on behalf of the people of Nevis. 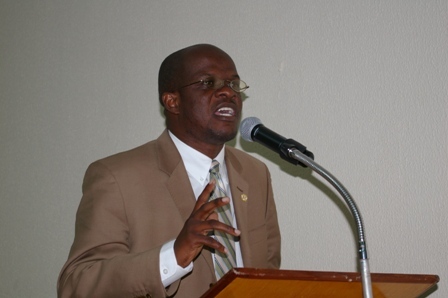 It must be done to encourage other institutions to establish in Nevis,” said the Attorney General. According to a recent study in St Kitts, the 6 medical universities in St. Kitts contributed 14 percent to the Gross Domestic Product (GDP). Mr. Nisbett said that breaking the monopoly had nothing to do with the school but it had to do with a poorly negotiated contract with the former CCM Administration. An example of the telecommunication monopoly was detailed by Mr. Nisbett to the crowd of over 100 attendees of the St. Maarten meeting. He said when the Organization of Eastern Caribbean States (OECS) governments decided to break the monopoly of Cable and Wireless telecommunications in the region, negotiations took place and after awhile it was agreed that additional companies would be allowed in the market. Today, consumers are benefitting from the era of liberalization in the telecommunications industry and now, one can choose from using LIME, Digicel or Chippy.